Kilkenny wasn’t looking for trouble when he entered the Clifton House stage station, but trouble found him when a reckless youngster named Tetlow challenged him, drew his gun, and paid for it with his life. Looking to escape a reputation that he never wanted, Kilkenny settles in the lonely mountain country of Utah, planning to ranch a high, lush valley. But the past is on his trail. Jared Tetlow is a powerful rancher determined to run his vast herd on the limited grasslands there—whether he has to buy out the local ranchers, run them out, or kill them. He’ll cut down anyone who stands in his way, especially a man he already despises: the gunman named Kilkenny—the man who killed his son. 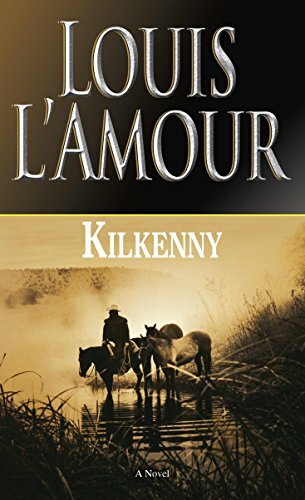 Kilkenny is one of Louis L’amour’s more written about gunslingers. The book Kilkenny is the second in the series about this gunslinger who fights for good. The first book, The Riders of Lost Creek, the third book, The Mountain Valley War, and a few short stories written about this character are good, but this one is definitely my favorite. Kilkenny does not want trouble, yet it seems to follow him no matter where he goes along. This man is a true replica of what we like to think the good gunslingers of the west were like. The bad guy wants to revenge the death of his son that Kilkenny killed in a gunfight. Mr. Tetlow, the bad guy, is greed and a tyrant that just wants to see Kilkenny dead. This book has language, fighting, and gun battles as well as a good old love story.